Today the tickets go on sale for the 53rd edition of the Joan Gamper Trophy, which will be held on Wednesday, August 15 at 6.15pm CEST. The match against Boca Juniors, who have already played in this competition on five previous occasions, will once again be the starting point for the new season and will see the official presentation of the 2018/19 Barça squad. The match will be the culmination of a busy day of activities. The Stadium and its surroundings will once again offer a multitude of shows for the whole family, and particularly for children. 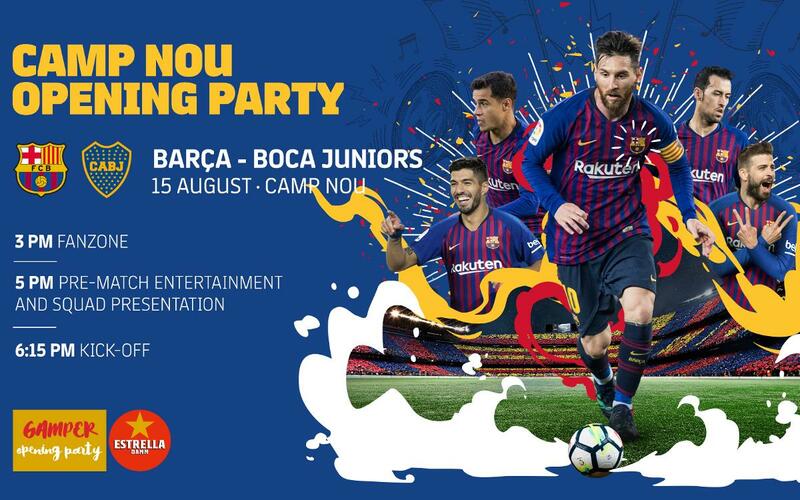 Boys and girls will be able to enjoy games and spend a special day with Barça. Some of these activities will also be water based and therefore refreshing to help combat the high temperatures that are so common in August. Tickets to attend the Joan Gamper Trophy can be purchased through the Club website and at the Camp Nou ticket offices from 9.15am to 7.30pm CEST. Members have a 30% discount on the price of the tickets purchased through the website. The activities of the Estrella Damm Gamper Party will begin at 3.00pm CEST and will last until 5.00pm. Inside the stadium, at 6.00pm, will be the presentation of the coaches and first-team squad, and the match between FC Barcelona and Boca Juniors will begin at 6.15pm.